Typical QLD set up of kilometre plate and trailblazer on the former section of NR71, heading south from Charleville. Photo taken: January 2005. 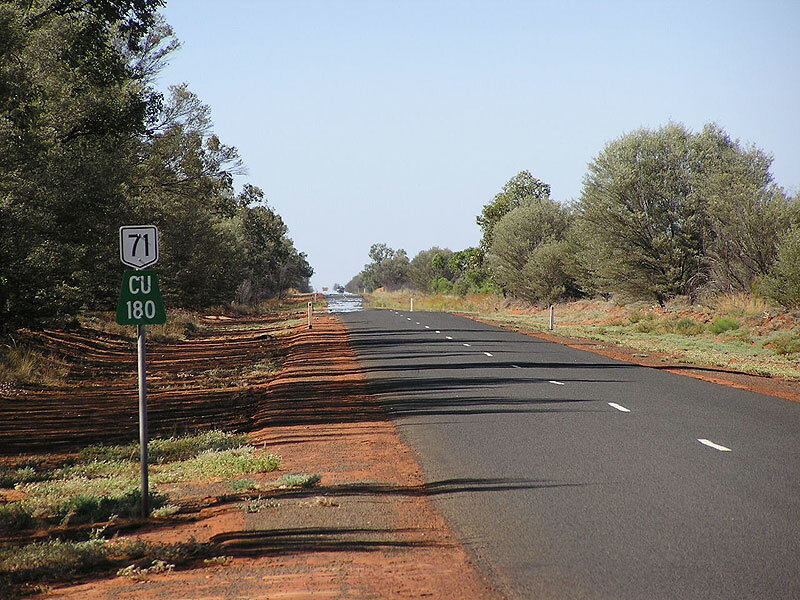 National Route 71 is the remnant of a remote north-south route through western NSW and central western QLD. 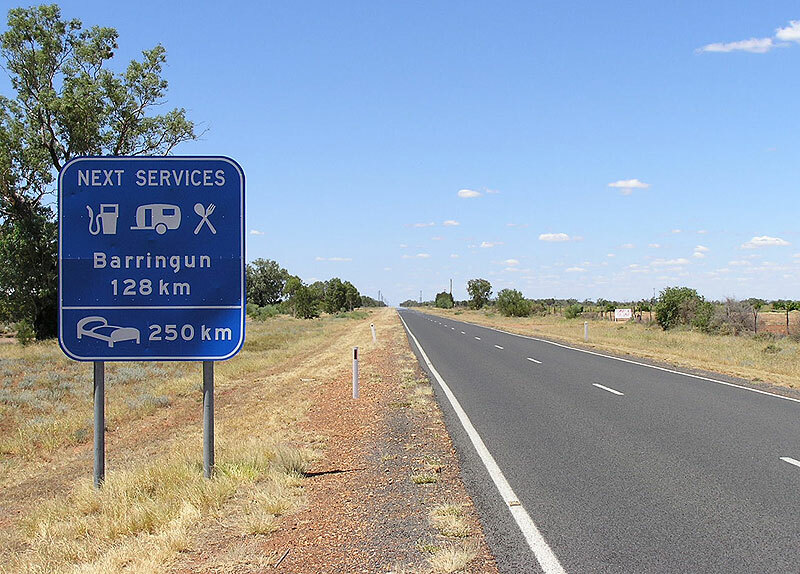 Originally stretching from Nyngan all the way to Barcaldine, the route has, in recent years, been truncated as part of the introduction of alpha-numeric route marking in Queensland. 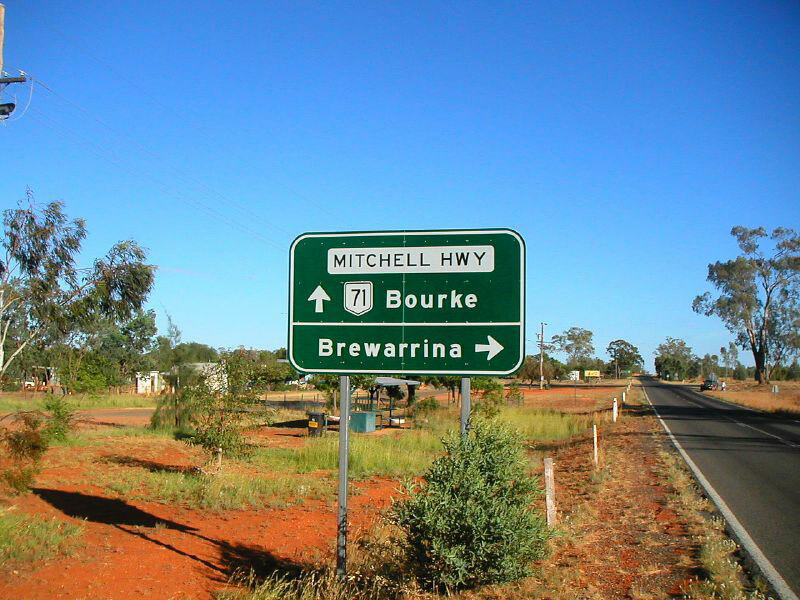 At present, National Route 71 is signposted from the junction of Mitchell and Barrier Highways at Nyngan, via Mitchell Highway to the NSW/QLD border at Barringun. Early plans for the National Route system saw National Route 71 as north-south route through western NSW and central western QLD, linking a number of east-west highways and forming part of the most direct route between Sydney and Darwin. 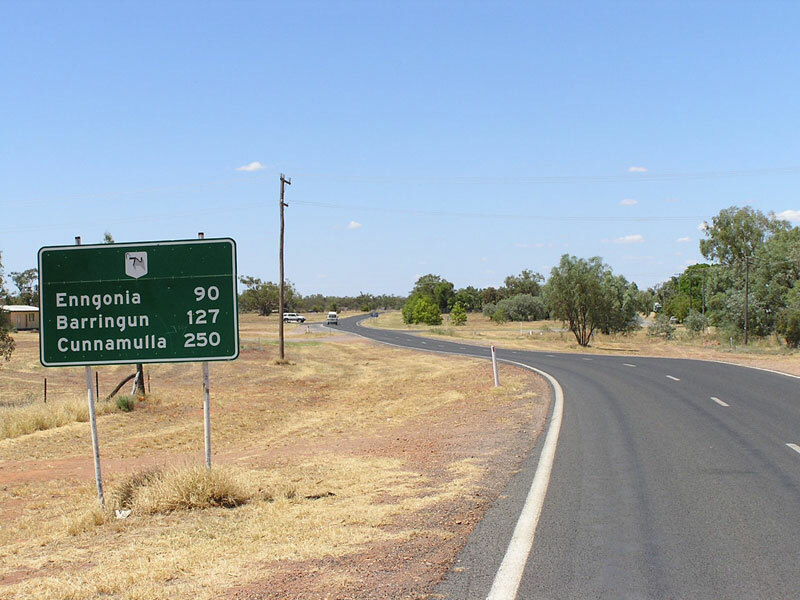 The first National Route 71 signs were erected in 1960 between Nyngan and Cunnamulla, as an extension to the then recent marking of National Route 32 between Sydney and Nyngan (and on to Adelaide). 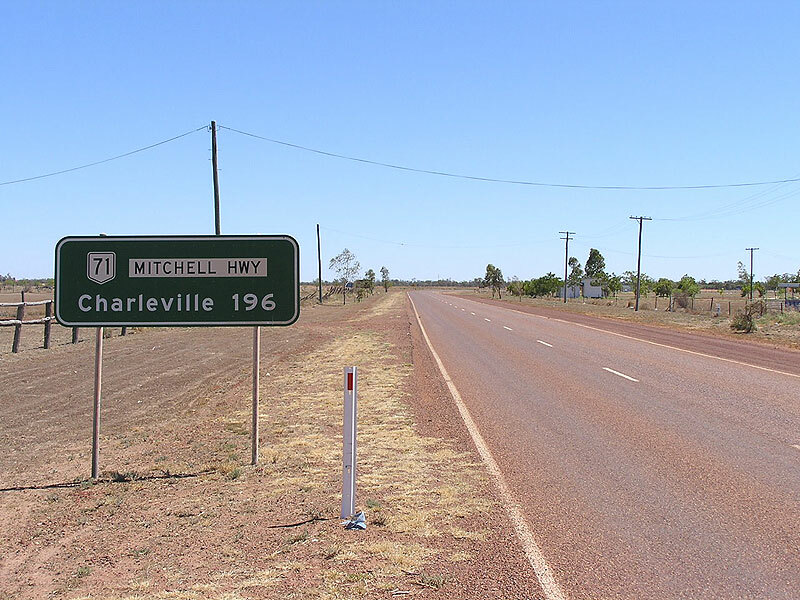 In 1968, National Route 71 was extended northwards through Charleville, Augathella, Tambo and Blackall to Barcaldine. 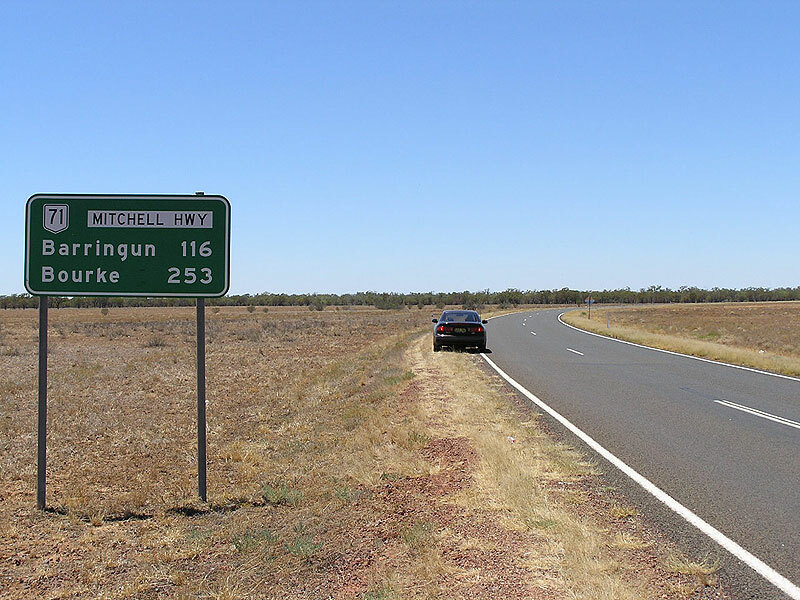 At the time, the vast majority of the route was unsealed - whilst sealing of Mitchell Highway in NSW was completed during the 1970s, it was not until the late 1980s that the entirity of the route through Queensland was fully sealed. 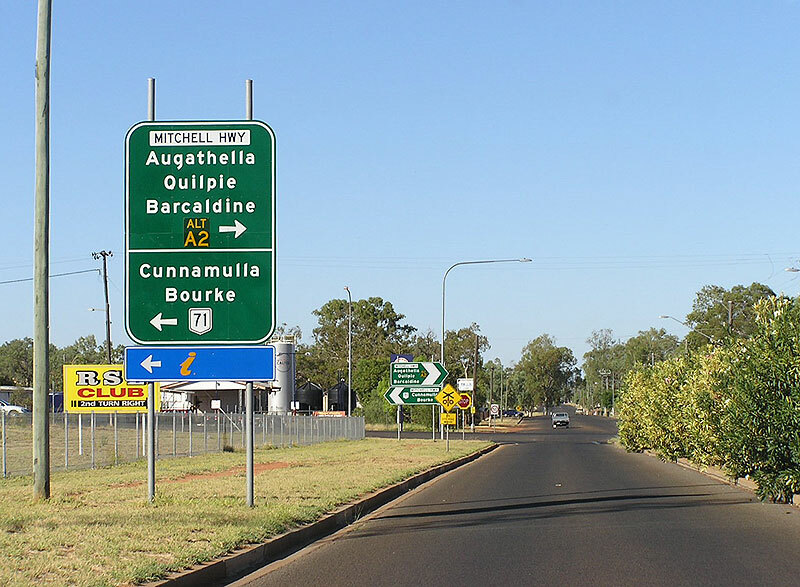 In 1974, the Landsborough Highway (Augathella-Barcaldine) section of National Route 71 was declared as part of the Brisbane-Darwin link of the former National Highway System. The black-and-white National Route 71 shields were replaced with the new green-and-gold National Highway shields in 1979, following a Federal Government decision to denote the National Highways with the distinctively-coloured shields. 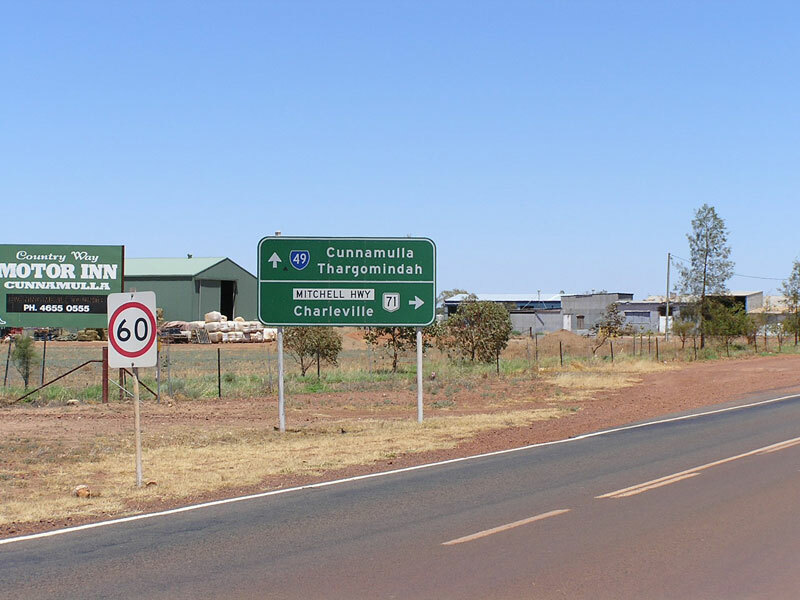 The full extent of the route lasted until 2002 when, as part of the first stage of alpha-numeric route marking in Queensland, the portion of the route between Charleville and Barcaldine was decommissioned. Route A2 replaced NH71 between Augathella and Barcaldine, whilst route Alt-A2 replaced NR71 between Charleville and Augathella. 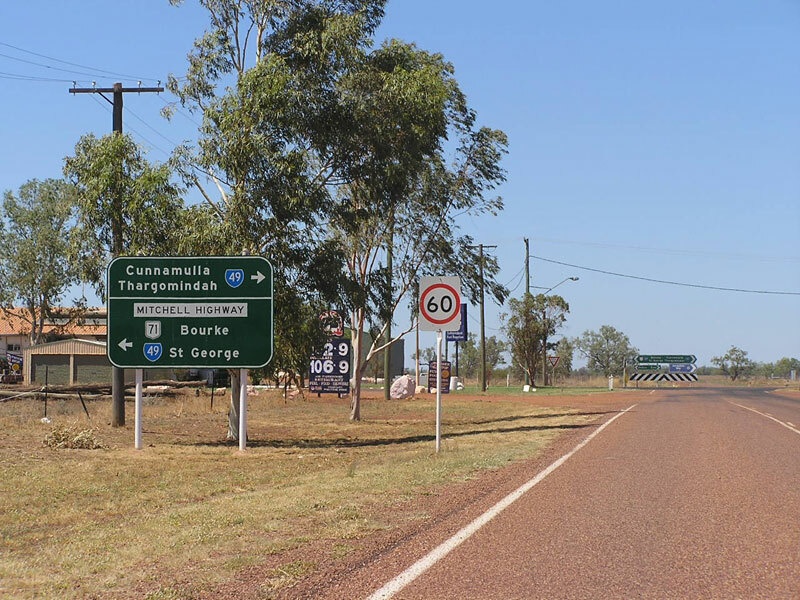 New 'END NR71' signage was erected at the junction of Mitchell Highway & Warrego Highway in Charleville to mark the new northern terminus of the route. 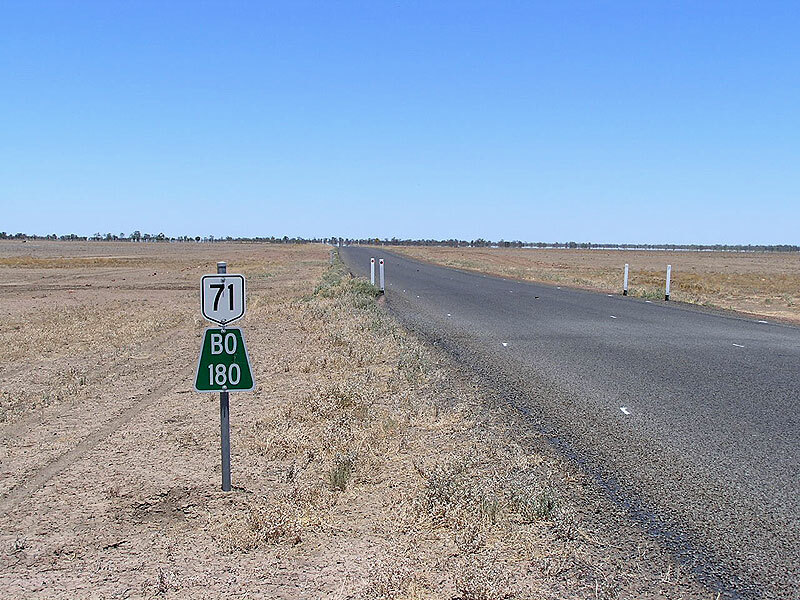 Conversion of the remaining portion of National Route 71 in Queensland to alpha-numeric route marking - route A71 - was commenced late in 2004, with scattered A71 trailblazers evident on a trip along the route in January 2005. However, it was not until May 2007 when the route was properly decommissioned, with the replacement of all NR71 shields with A71. It is proposed, as part of the introduction of alpha-numeric route marking in New South Wales, to replace the remainder of National Route 71 with route A71. 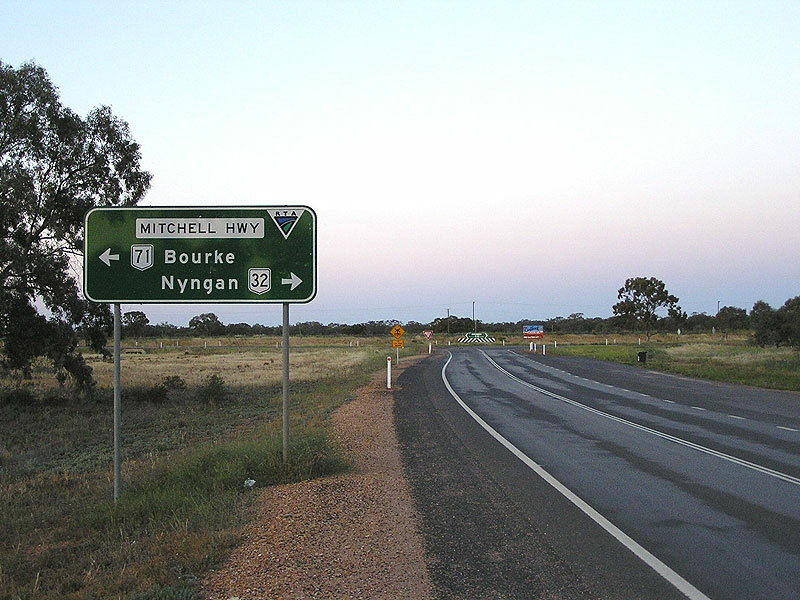 No changeover date has been set, although a large number of signs between Nyngan and Bourke were replaced during late 2008 in anticipation of the changeover. Looking south at the NSW/QLD Border at Barringun. 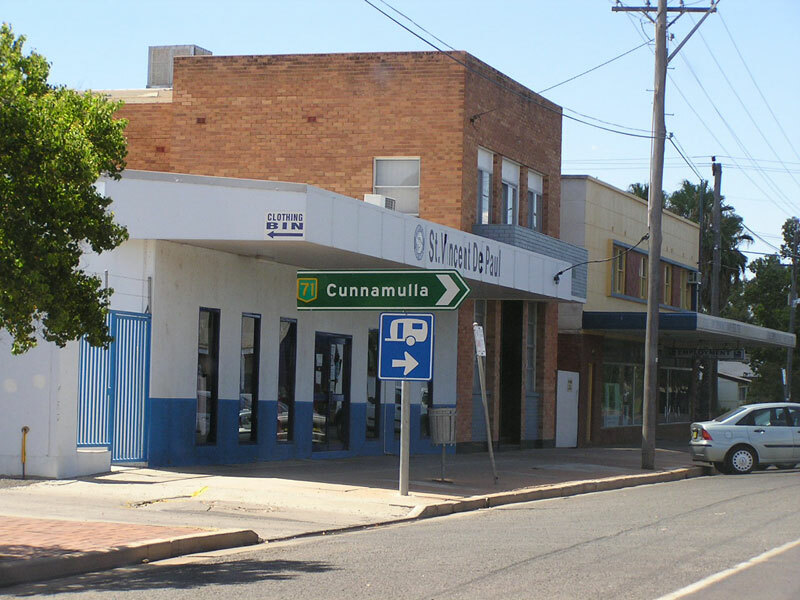 Note the older (1990s) style border sign with a newer (September 2003) Tourism NSW sign in the background. The border marks the present northern terminus of National Route 71 and the southern terminus of route A71. Mitchell Highway (NR71) looking south into the tiny village of Barringun, just south of the NSW/QLD border. 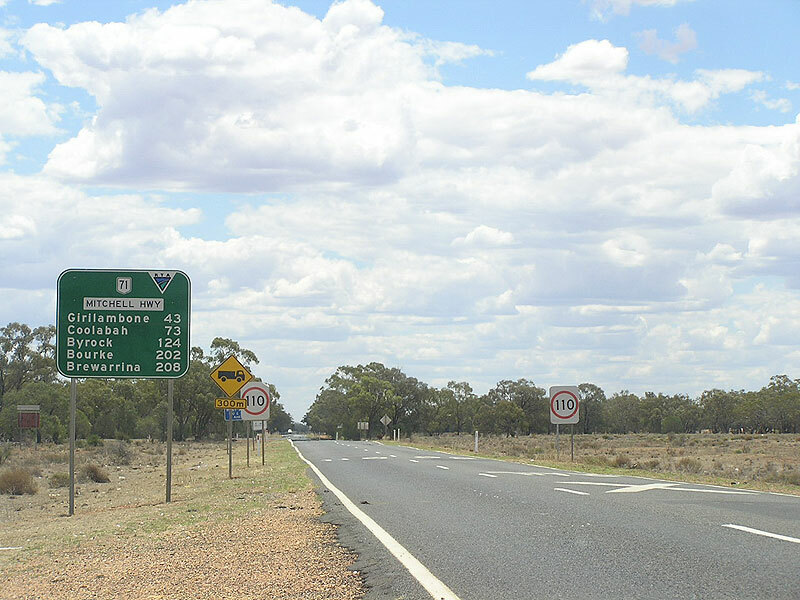 Typical remote NSW service signage, southbound on Mitchell Highway (NR71) leaving Barringun. Kidman Way tourist sign, heading south from Barringun. 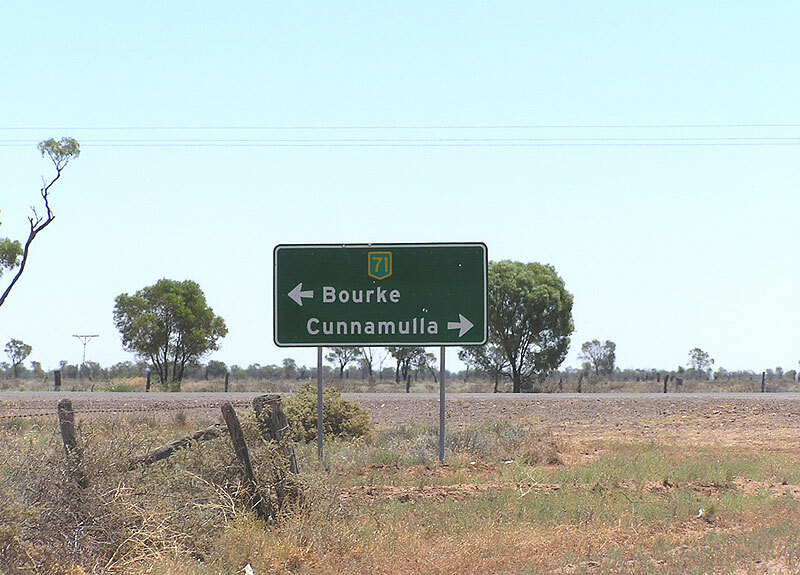 This sign is slightly deceptive, however, as the Kidman Way does not begin until Bourke. 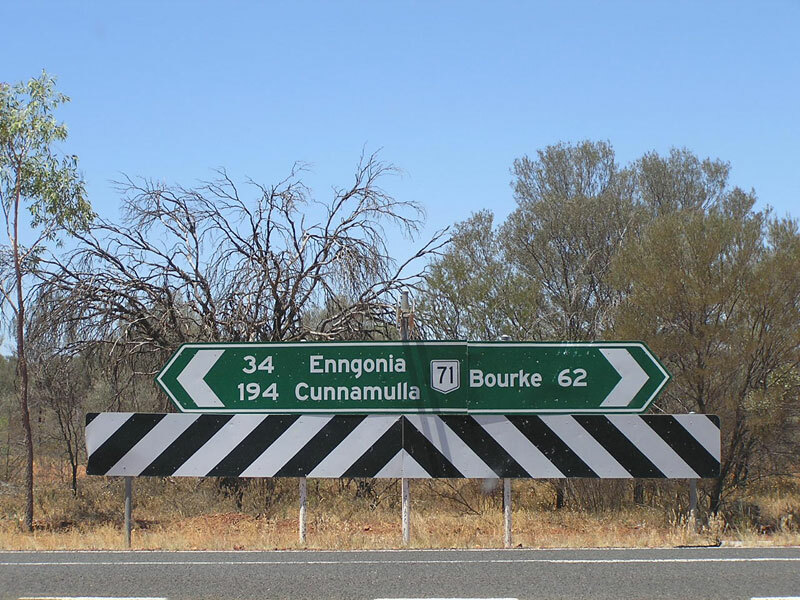 Fingerboard sign assembly in the tiny village of Enngonia, 97km north of Bourke. 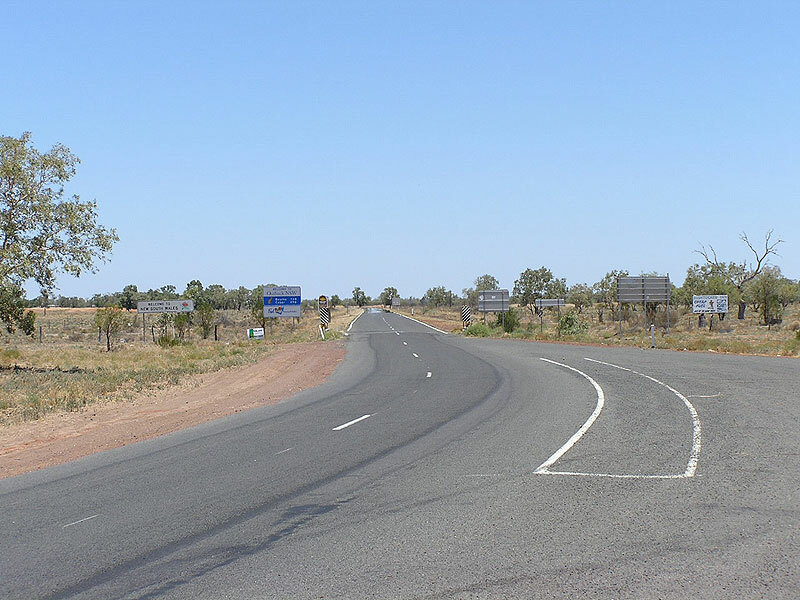 Typical view of Mitchell Highway (NR71) looking south, south of Engonnia. 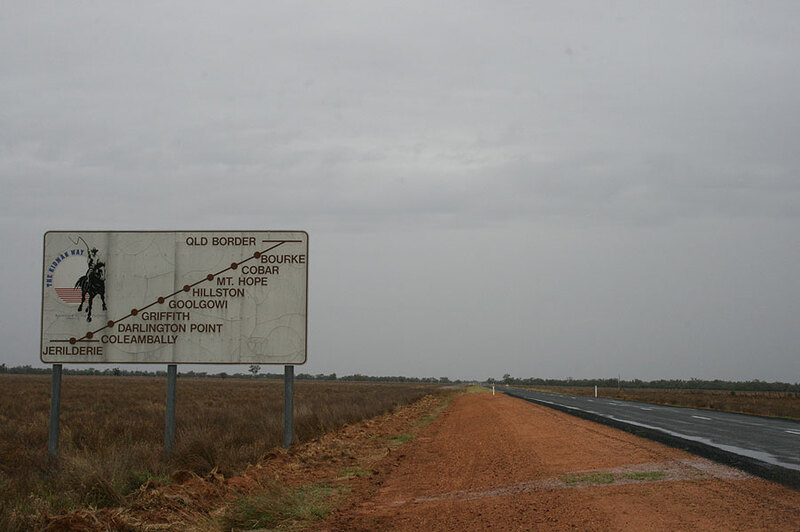 Non-standard fingerboard sign on Mitchell Highway (NR71) at the Fords Bridge turnoff, 62km north of Bourke. 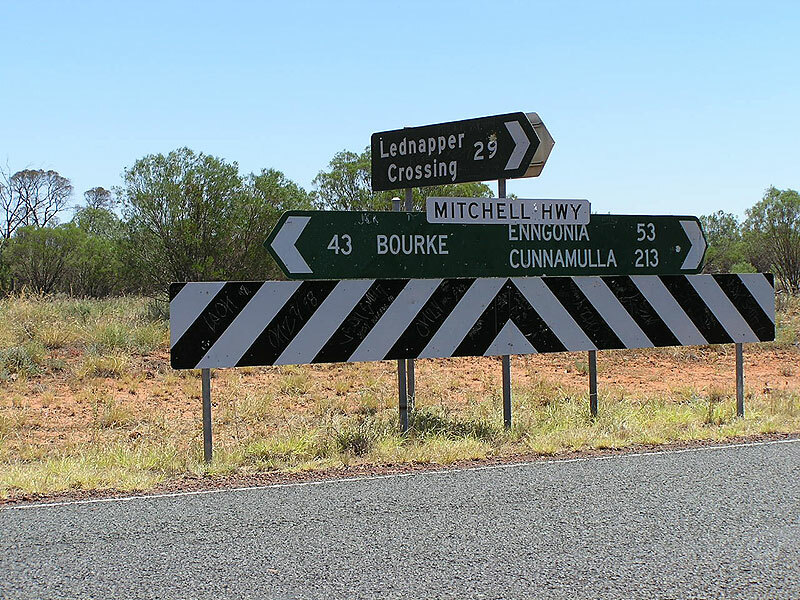 Poorly-designed fingerboard sign assembly, incorrectly using capital letters and omitting a NR71 shield, at theturnoff to Lednapper Crossing, 43km north of Bourke. Properly designed fingerboard sign assembly with one mistake - the NR32 shield should be a NR71 shield! 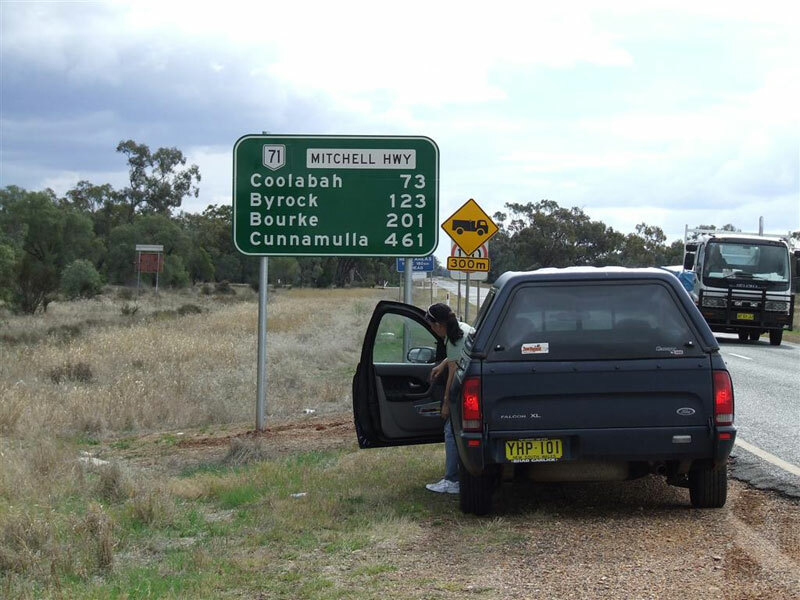 - at the turnoff to Collerina, 29km north of Bourke. Non-standard, poorly designed AD sign on Main Road No. 425 (Bourke-Weilmoringle) approaching Mitchell Highway (NR71), 16km north of Bourke. Note the incorrect National Highway shield. 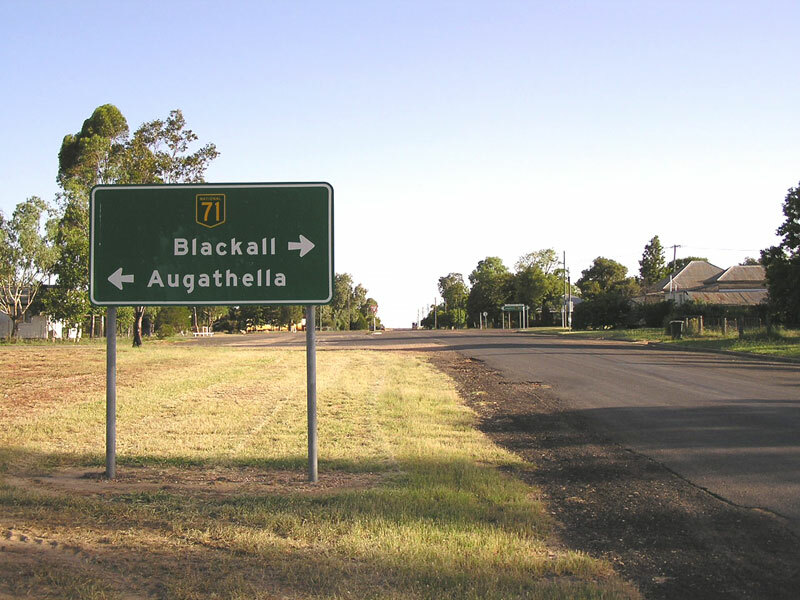 Black AD sign northbound on Mitchell Highway (NR71) approaching the junction with Main Road No. 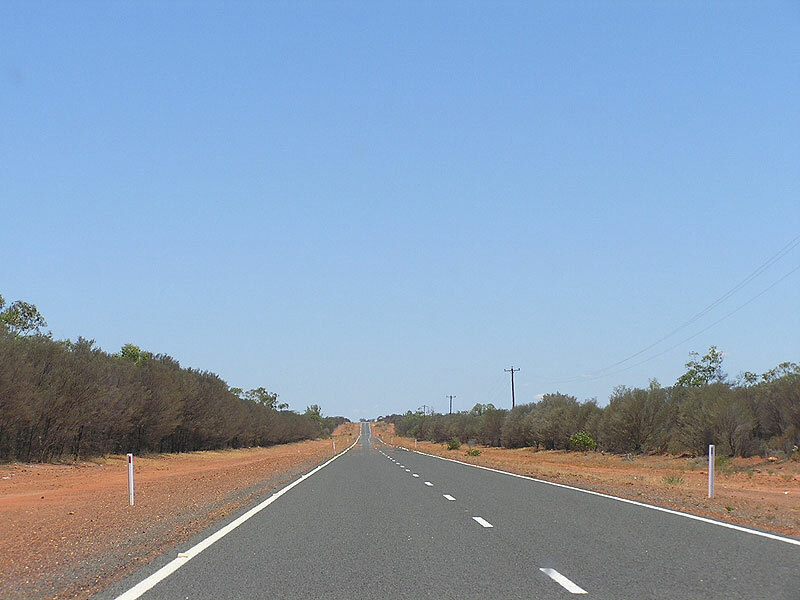 425, 16km north of Bourke. 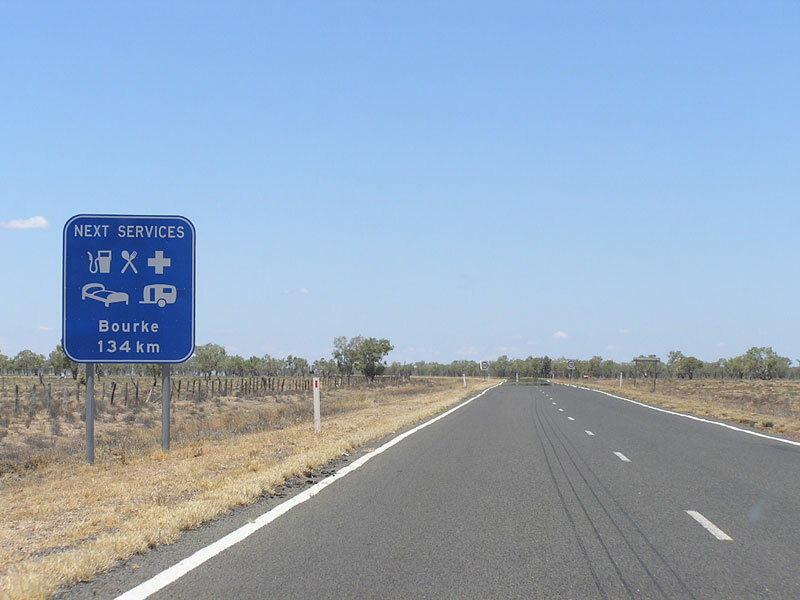 Typical remote NSW services signage, northbound on Mitchell Highway (NR71) leaving North Bourke. 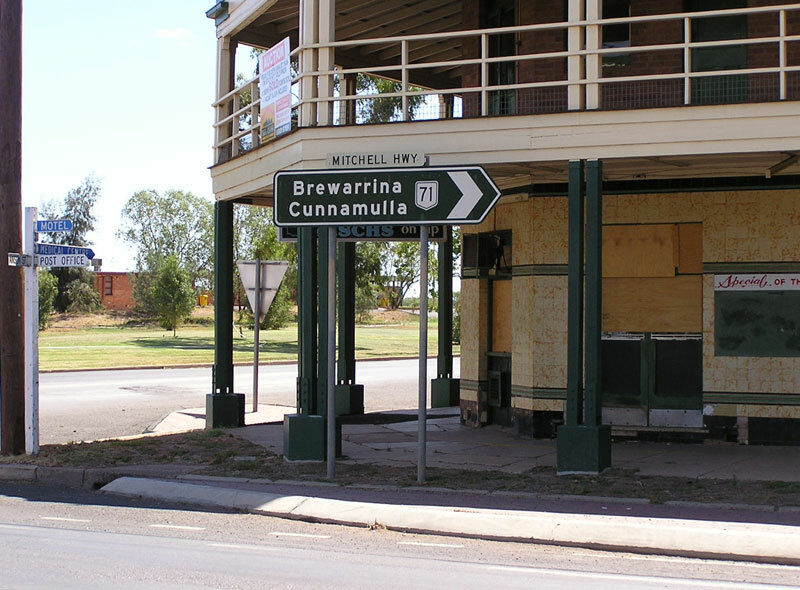 The accommodation 250km away is at Cunnamulla, QLD. 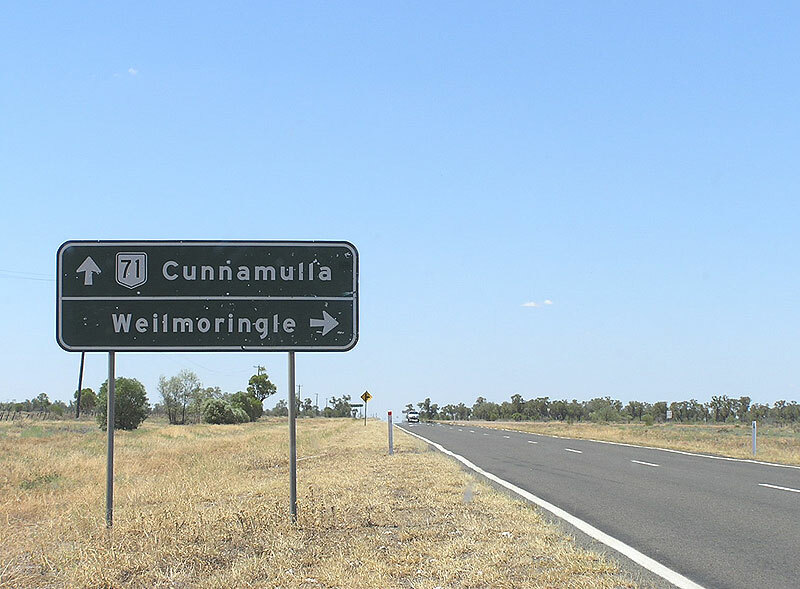 Non-standard RD sign with peeling NR71 shield, northbound on Mitchell Highway (NR71) at North Bourke. Non-standard AD sign, missing a NR71 shield, southbound on Mitchell Highway (NR71) approaching Main Road No. 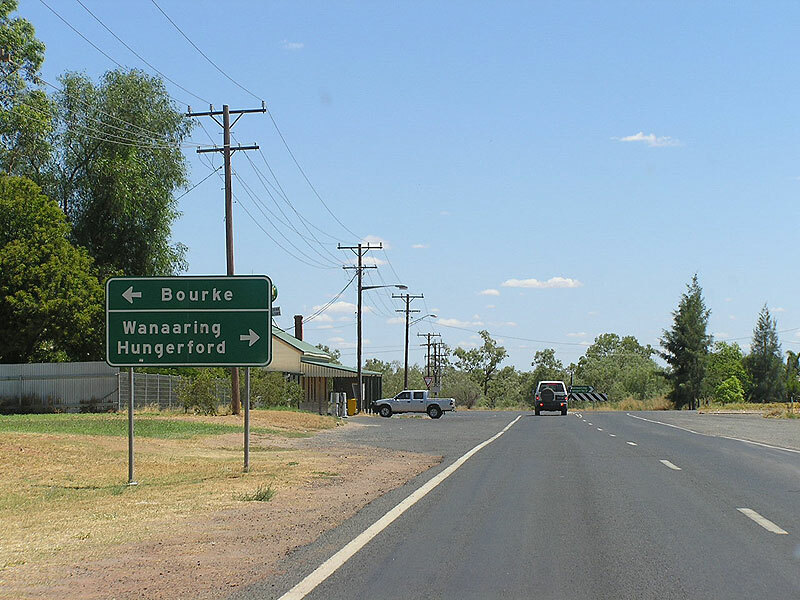 404 (North Bourke-Hungerford) at North Bourke. 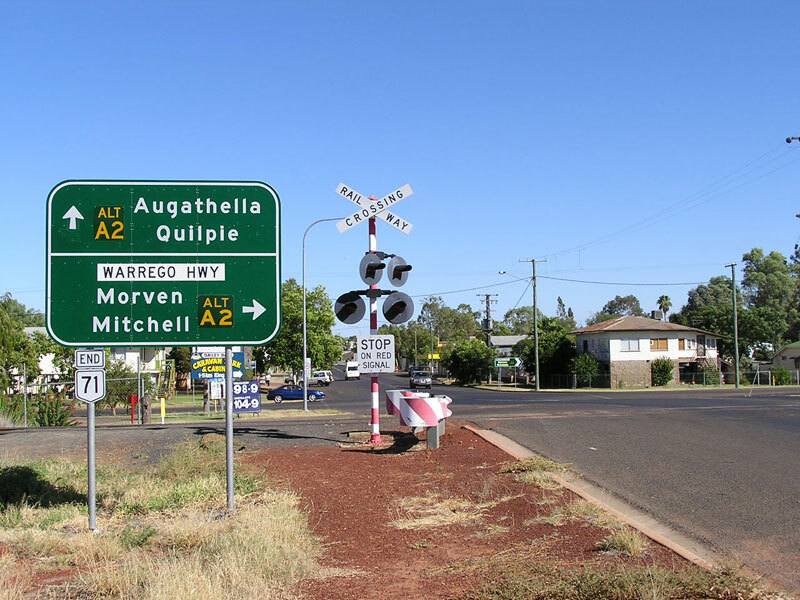 Mitchell Highway and NR71 both make the left turn across the Darling River towards Bourke. Another non-standard and poorly designed AD sign, this time at least sporting a NR71 shield, eastbound on M.R. No. 404 approaching Mitchell Highway (NR71) at North Bourke. 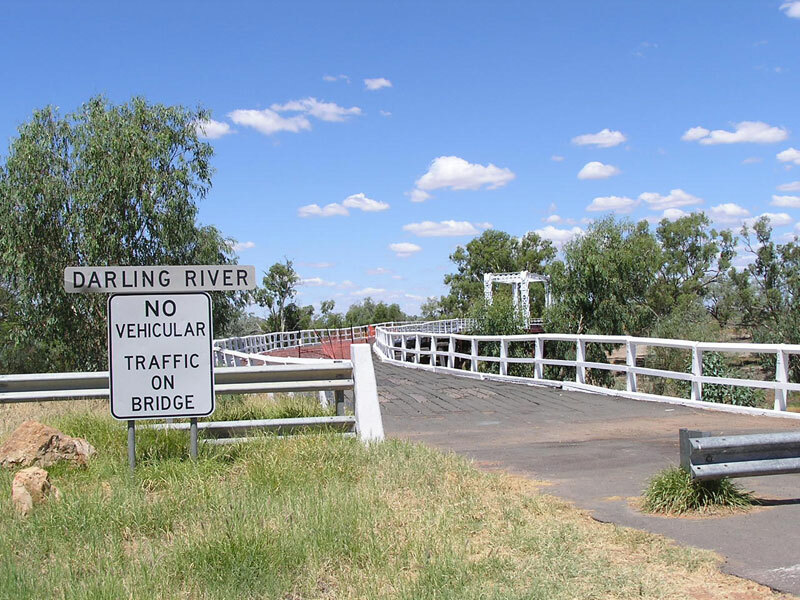 Looking east to the original bridge over the Darling River at North Bourke. 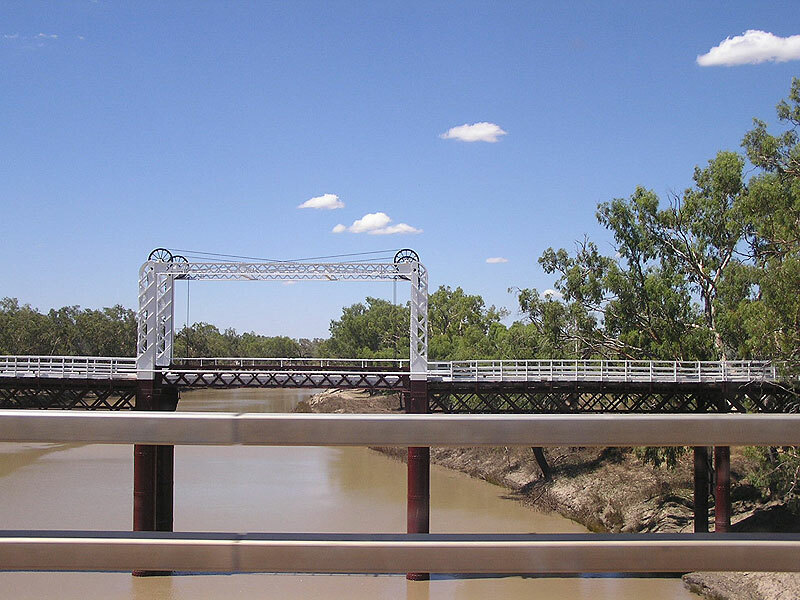 Constructed in 1893, this timber bridge with a bascule opening span to cater for long-dead river traffic carried the Mitchell Highway until replaced by the adjacent two-lane bridge in 1997. A view of the bascule opening span, taken from a vehicle traversing the current bridge. 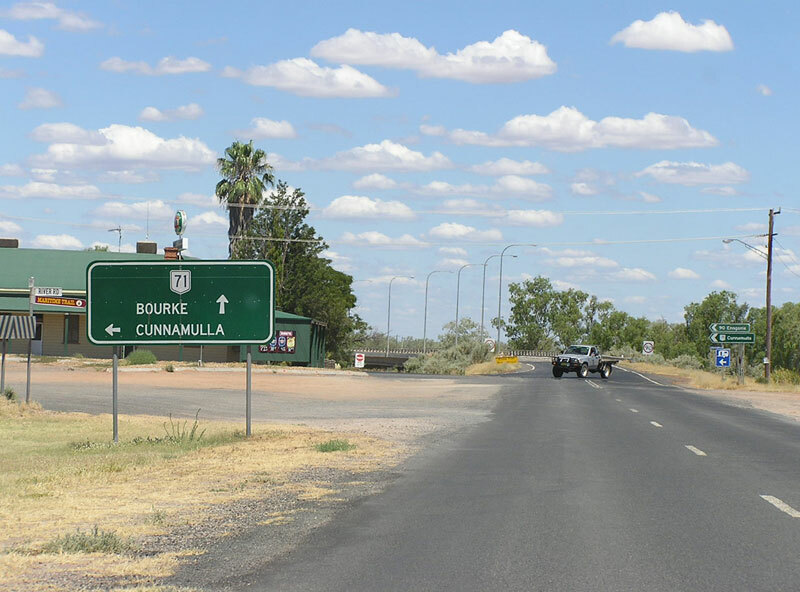 Non-standard RD sign with illegible NR71 shield, northbound on Mitchell Highway (NR71) leaving Bourke. 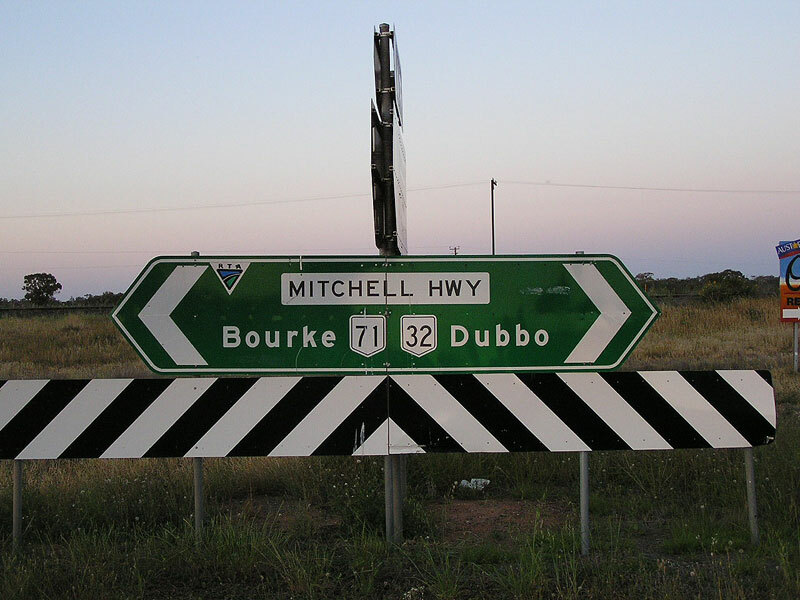 Poorly designed AD sign southbound on Mitchell Highway (NR71) approaching the junction with Kamilaroi Highway (NR37), Bourke. Note the premature mention of Kidman Way, which does not commence until south of Bourke town centre. 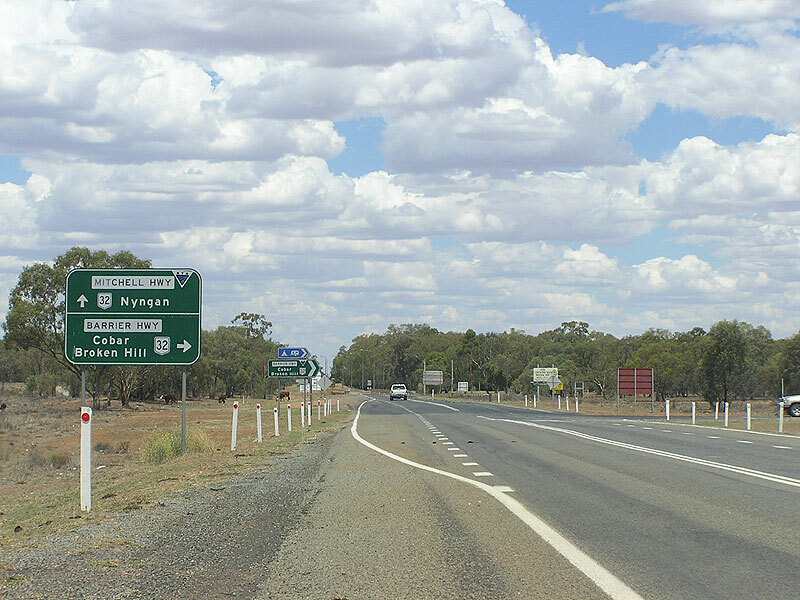 Poorly-designed AD sign westbound on Kamilaroi Highway (NR37) approaching the junction with Mitchell Highway (NR71). Note the incorrect National Route 75 shield! Another poorly-designed sign - this time northbound on Mitchell Highway (NR71) approaching the intersection with Mitchell St & Richard St. Mitchell Highway makes the right turn from Richard St onto Mitchell St at the northern end of Bourke town centre. 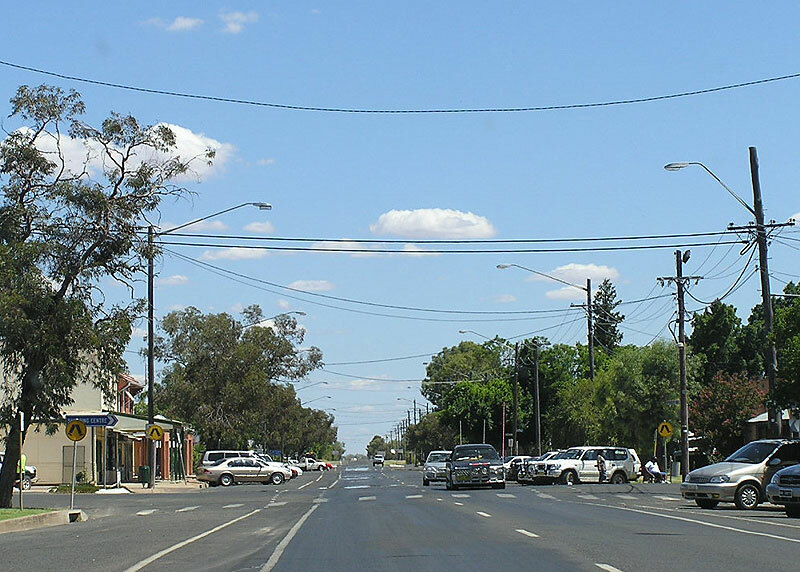 Mitchell Highway (NR71) looking south along Richard St, through the town centre of Bourke. 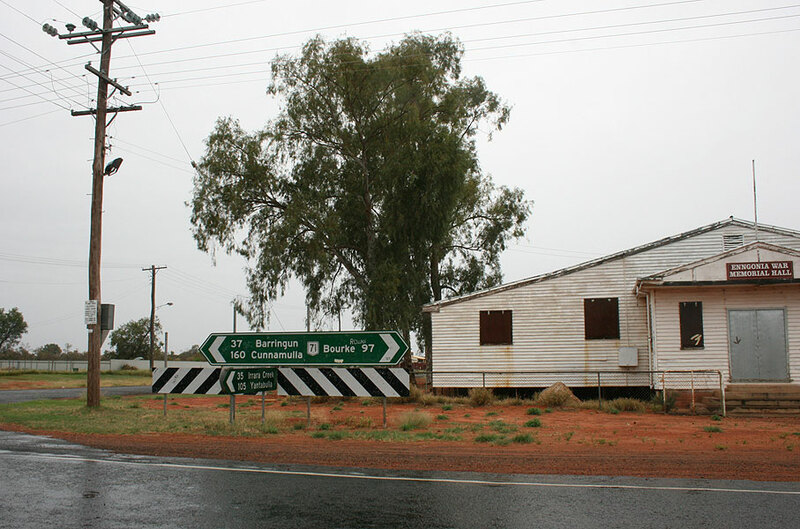 A fantastic relic - black ID sign at the intersection of Mitchell Highway (NR71), Kidman Way (SR87) & Anson St, Bourke. Perfectly designed black AD sign westbound on Mitchell Highway (NR71) approaching the junction with Kidman Way (SR87) & Anson St, Bourke. 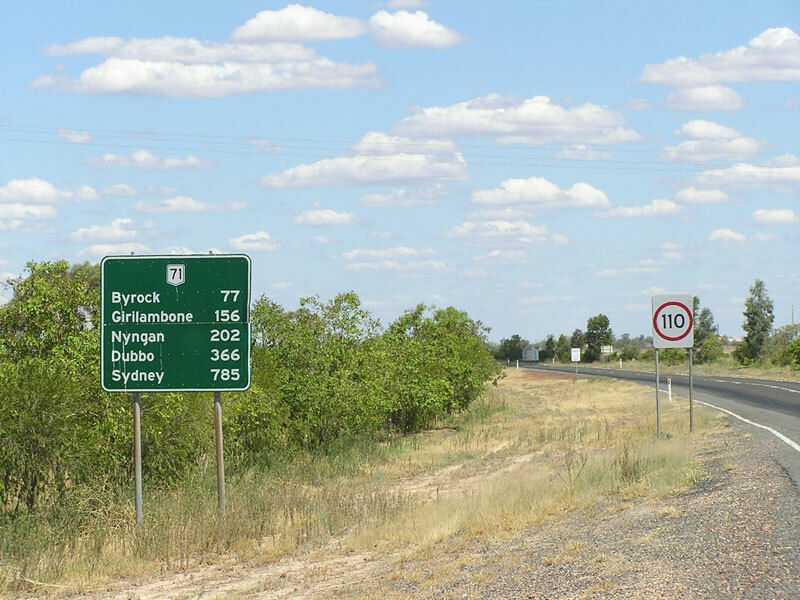 Note that this sign pre-dates to extension of State Route 87 from Hillston to Bourke and hence is now incorrect. 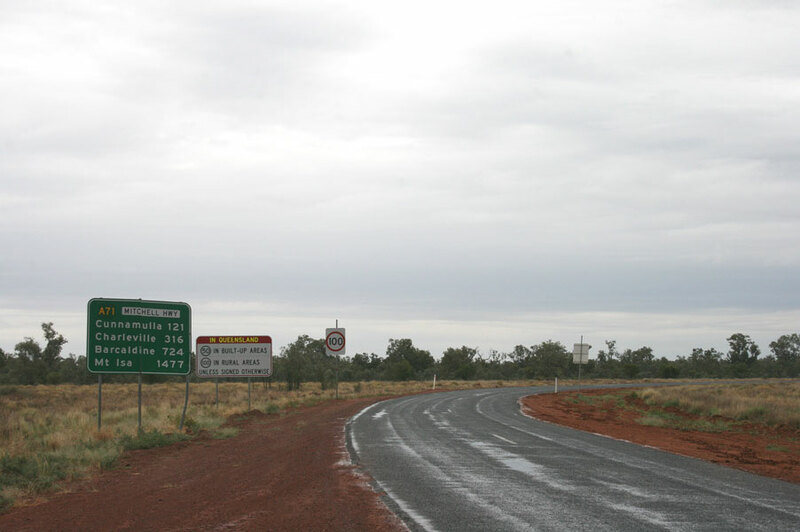 Another poorly designed sign - this time the RD sign heading south on Mitchell Highway (NR71) from Bourke. 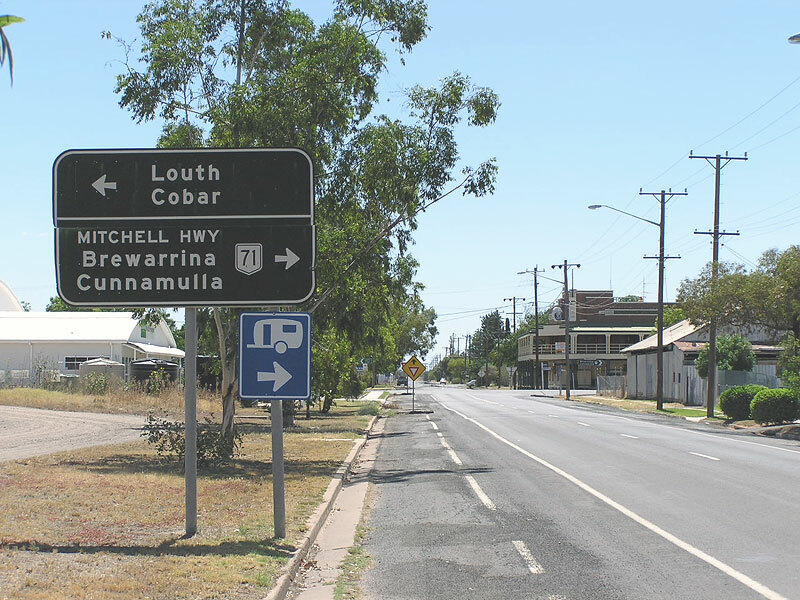 Mitchell Highway (NR71) northbound at Coolabah, approaching the junction with Main Road No. 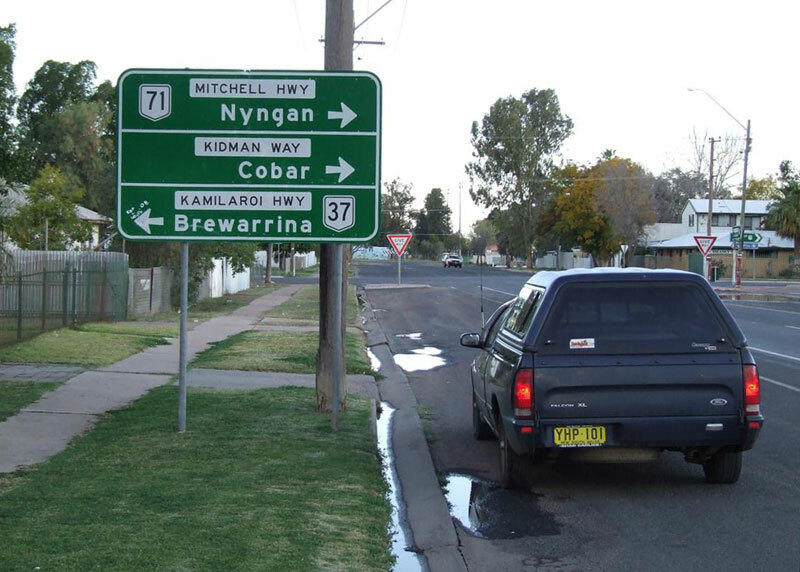 70 (Coolabah-Brewarrina-Goodooga). Mitchell Highway (NR32) northwestbound approaching the junction with Barrier Highway (NR32) on the western outskirts of Nyngan. The only remnant of National Highway 71 - AD sign southbound on Dawson Developmental Rd, approaching Landsborough Highway at Tambo. Mitchell Hwy (Alt-A2) southbound approaching the Warrego Hwy and the beginning of NR71 in Charleville. Jan 2005. Warrego Hwy heading west, apporoaching the beginning of NR71 at the Mitchell Hwy in Charleville. ID signs facing westbound traffic at the same intersection. Note that Alt-A2 is on a coverplate over NR71. Jan 2005. "End NR71" trailblazer, northbound on Mitchell Hwy approaching the Warrego Hwy at Charleville. Note how the Alt-A2 is on a coverplate over National Route 71 (straight) and State Route 14 (right). 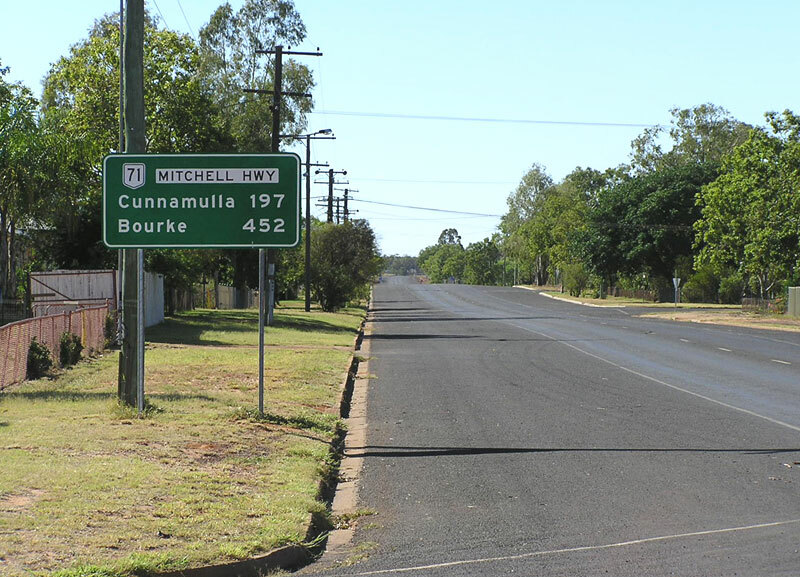 The first RD sign southbound on Mitchell Highway (former NR71) in Charleville. 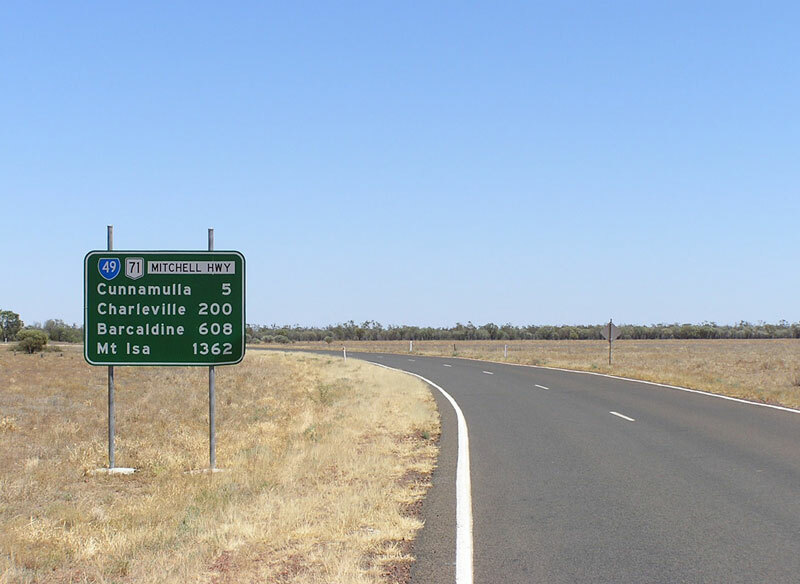 AD sign westbound on Charleville-Bollon Rd approaching Mitchell Highway (former NR71) in Charleville. RD sign southbound on Mitchell Highway (former NR71), heading south from Charleville. 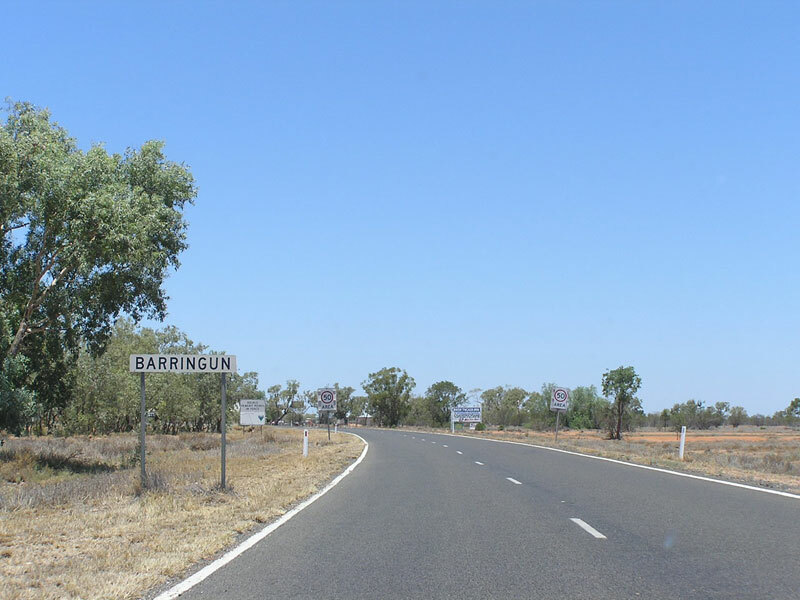 Note the unusual use of Barringun instead of Bourke as the remote focal point. 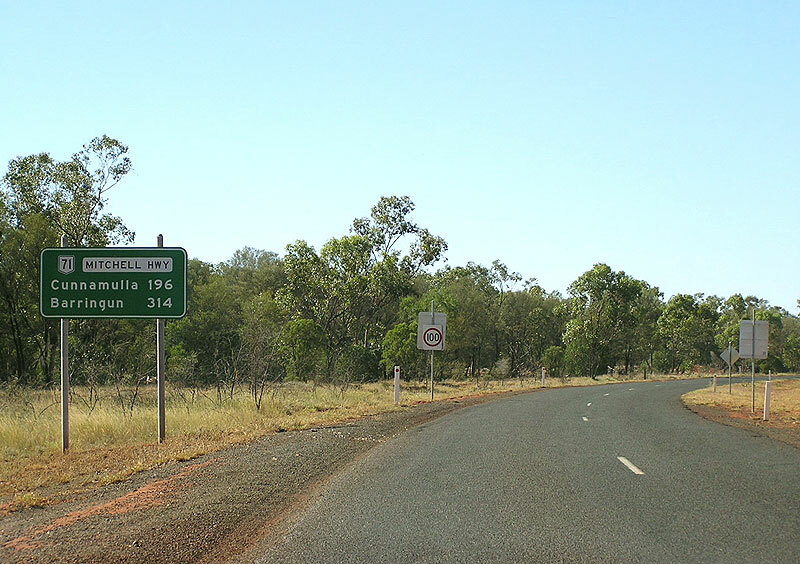 Typical QLD set up of kilometre plate and trailblazer on the former section of NR71, heading south 17km from Charleville. 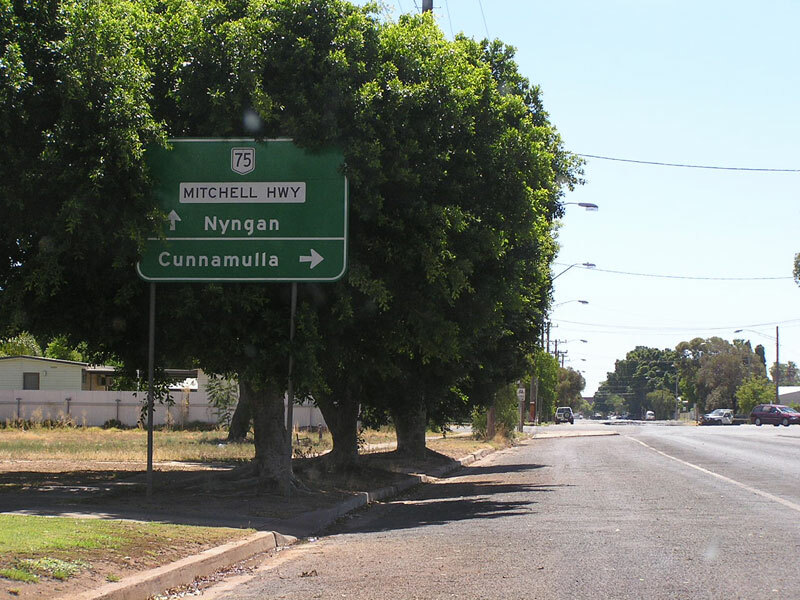 RD sign northbound on Mitchell Highway (former NR71) leaving Cunnamulla. 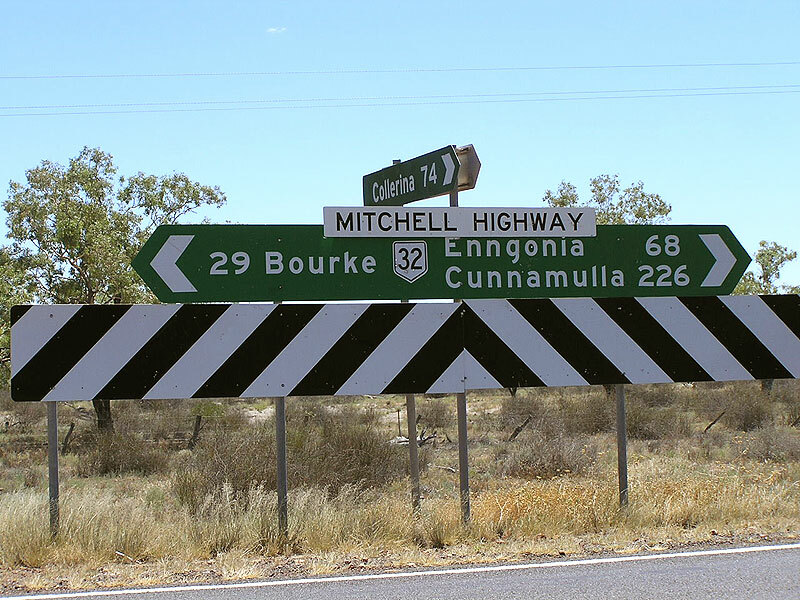 AD sign southbound on Mitchell Highway (former NR71) approaching the junction with Bulloo Developmental Rd (SR49) on the eastern outskirts of Cunnamulla. 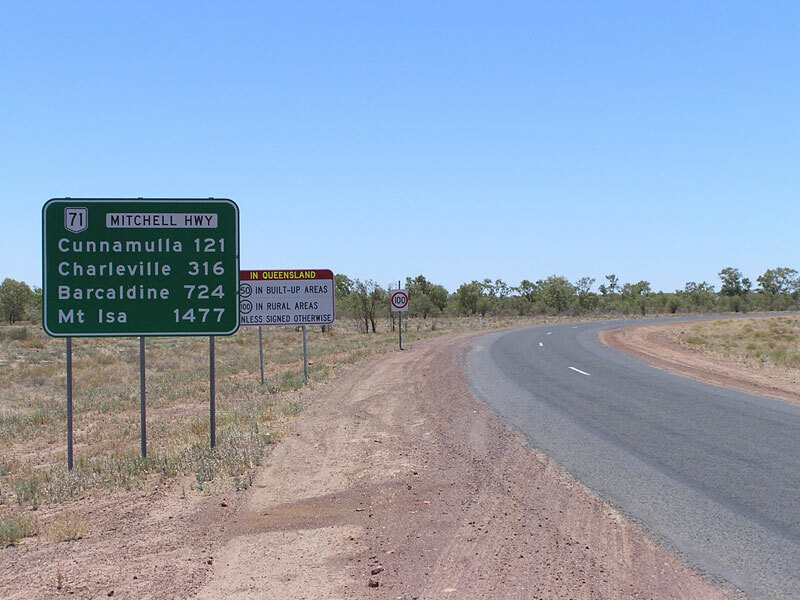 ID sign assembly at the intersection of Mitchell Highway (former NR71) & Bulloo Developmental Rd (SR49), Cunnamulla. State Route 49 continues east along a short section of Mitchell Highway, then via Ballonne Highway to St George and beyond. 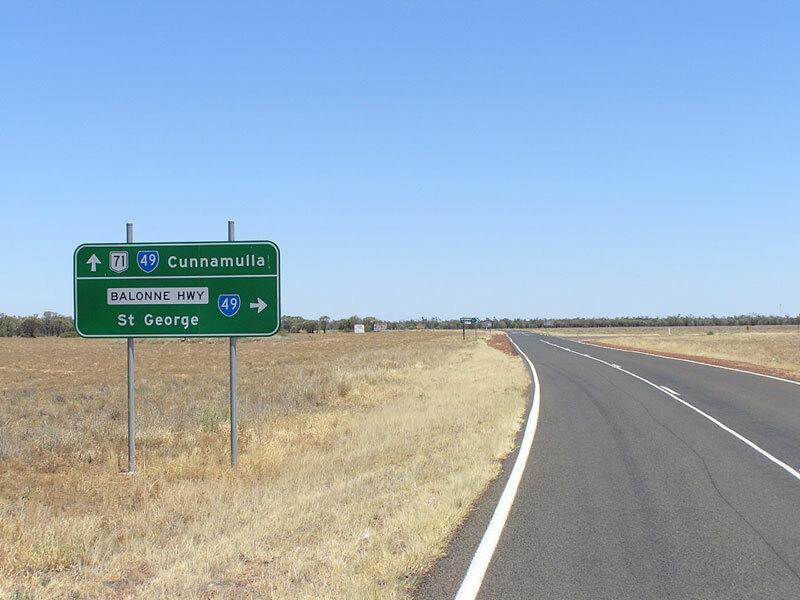 AD sign westbound on Mitchell Highway (former NR71) approaching Bulloo Developmental Rd (SR49), Cunnamulla. 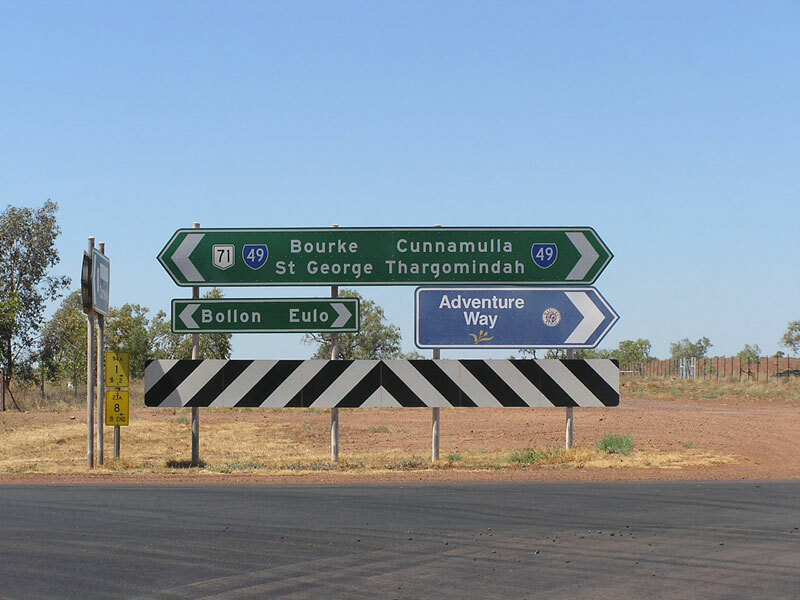 RD sign heading east from the junction with Balonne Highway (SR49), 5km east of Cunnamulla. 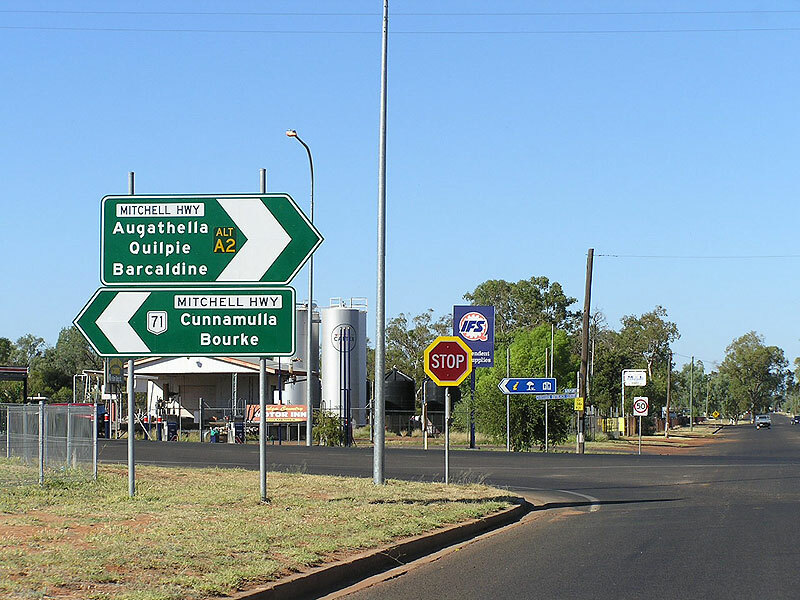 Note the long range focal points of Barcaldine and Mt Isa are not followed up on the RD sign at Cunnamulla. 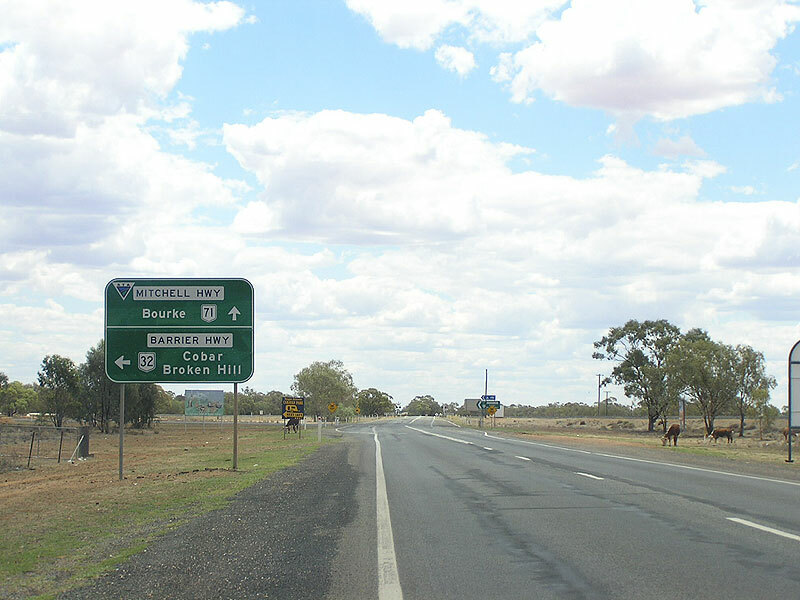 AD sign westbound on Balonne Highway (SR49) approaching Mitchell Highway (former NR71), 5km east of Cunnamulla. 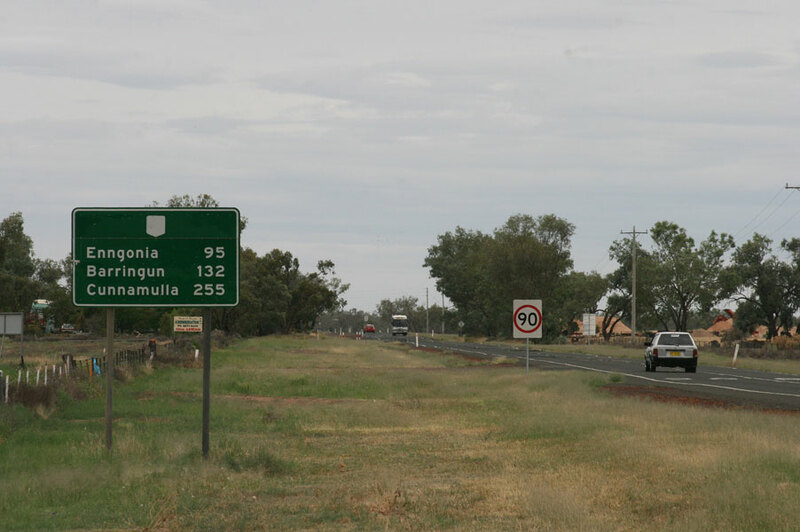 AD sign northbound on Mitchell Highway (former NR71) approaching the junction with Balonne Highway (SR49), 5km east of Cunnamulla. RD sign heading south on Mitchell Highway (former NR71), south of the junction with Balonne Highway (SR49). 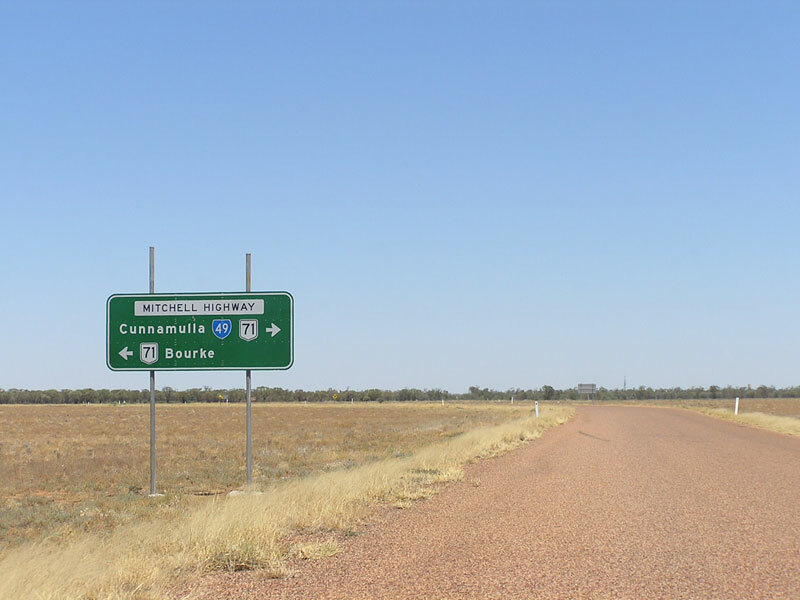 Typical QLD setup of kilometre plate and trailblazer, this time 78km south of Cunnamulla, approaching the NSW/QLD Border. Top: Northbound RD sign at the NSW/QLD Border, showing National Route 71. 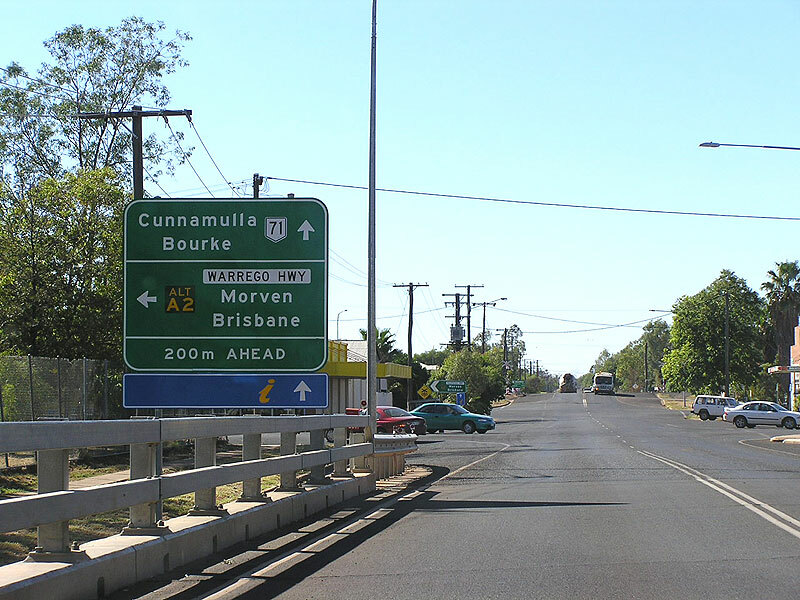 Bottom: Northbound RD sign at the NSW/QLD Border following the conversion of National Route 71 to A71 in Queensland.